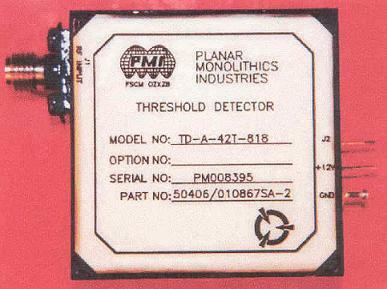 PMI Model TD-A-42T-818 is a Hermetically Sealed Threshold Detector optimized for the 8 to 18 GHz Frequency Range. It has an internally fixed Threshold Level providing a Minimum Signal Level of -42 dBm and a Maximum Input VSWR of 2.5:1. The Threshold Setting Stability is constant +/-3.0 dB over the operating temperature and frequency. Detected Output The Detector Output Signal shall be a TTL Level high when the RF Signal applied to the RF Input exceeds the threshold level. Any Signals below the Threshold Level shall result in an output level of TTL Low (0) the TTL output shall be buffered in such that output loading has no effect on detector response. The detected output shall have a drive capacity of at least two standard TTL loads. Response Time For any RF input greater than 3 dB above Threshold. The maximum turn on response time measured at 90% RF to a TTL "1" output shall be 100 uS. The maximum turn off response time measured at 10% RF to a TTL "0" shall be 100 uS. Connectors The Input Signal Connector shall be a SMA Female in accordance with MIL-C-39012. The Output Signal Connection shall be a Solderable Pin (Diameter of 0.023" Minimum) with a Ground Lug next to it. The Power Connection shall be a solderable pin (Diameter of 0.023" Minimum).